PregAQUA includes Aqua for mums and for pregnancy. Our PregAqua post-pregnancy classes support the pelvic floor and guides you on how to exercise effectively. Our PregAQUA Classes are held in Croydon, Melbourne, Australia, and are designed to provide you with ongoing customised pregnancy and postnatal exercise workouts. Wanting to exercise safely during their pregnancy. Want to enjoy feeling ‘weightless’ during their pregnancy. New Mothers wanting to get back into exercise to recover pelvic floor and core strength. Fun, energising workout in 45 Minutes. Reduce Pressure from Back ache or Hip ache. Feel Healthier and More Energised. These PregAQUA classes focus on cardio fitness, core and pelvic floor strengthening, staying mobile and active! PregAQUA is a perfect class for women to wanting to stay active right up until the end of their pregnancy and to get right back into exercising post pregnancy. 1. There is a Social Component of PreAqua – Joining a PregAqua class is a great way to meet expectant and new mothers and gain valuable support. By having that social component you will likely be more motivated to continue attending your PregAqua sessions. 2. Buoyancy Provides Support for Your Body – Buoyancy supports your growing body and reduces the impact through the pelvic joints, lower back and pelvic floor. 3. Hydrostatic Pressure Assists the Cardiovascular System – Studies have shown that the hydrostatic pressure of water assists the cardiovascular system facilitating blood flow to the baby. Amniotic fluid has been found to increase. Hydrostatic pressure also helps to reduce swelling by forcing extra-vascular fluid into the circulation. This can help swollen ankles, carpal tunnel syndrome and varicose veins. 4. Thermoregulation Helps Regulate Body Temperature and Avoid Over-Heating – Water helps regulate body temperature so that overheating doesn’t occur when you are exercising. Pool temperature can be up to 32°C for moderate intensity exercise. 5. Water’s Weight Provides Resistance Against Muscles – You will get a great workout during aqua aerobics as water’s weight provides resistance against your muscles. If you wish to work even harder and create a greater resistance then you can use aqua equipment. 6. Water Can Promote Flexibility and Relaxation when Pregnant – Water’s buoyancy and support can gently increase your flexibility. water also promotes relaxation due to the weightlessness you feel when floating. 7. You Can Exercise in Water Up Until Your Due Date – As long as your doctor provides approval, you can continue to exercise in water right up to your due date. Studies have shown that the effects of hydrostatic pressure can be beneficial in the third trimester boosting blood flow to the baby and reducing maternal swelling. 8. Greater Enjoyment than Many Land based Exercise Workouts – Many women enjoy the feeling, comfort and support of exercising in water over land-based exercise workouts it much easier to move, exercise and relax your body than on land, especially in the last few months. 9. Reduce Impact on Joints and Ligaments – The buoyancy of the water cushions your body against jarring and helps to reduce the impact on your body’s joint sand ligaments. 10. 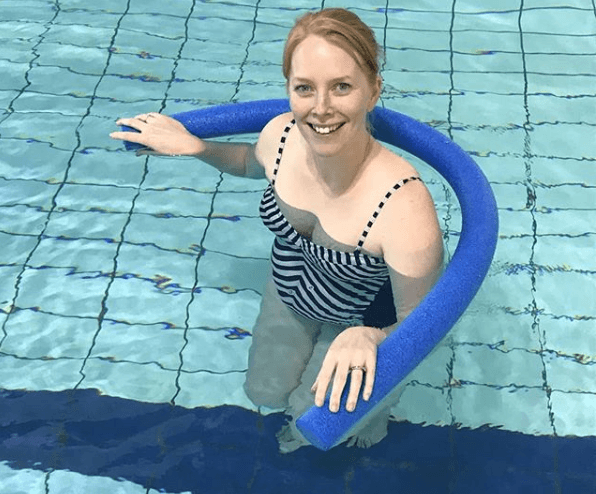 Tone Your Deep Abdominal Core – Exercising in water can tone your deep abdominal core, including your pelvic floor muscles which are important in reducing your chance of persistent incontinence both during pregnancy and after giving birth. When you do exercises in water, your abdominal muscles are engaged and lengthened because they’re working to keep you balanced.